Broomball is like playing hockey in your sneakers! 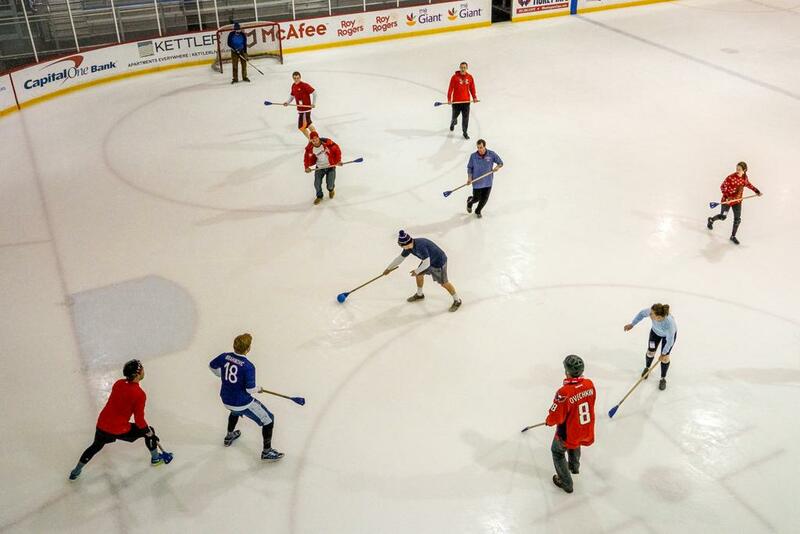 Use our special broomball sticks and break into teams for a fun game for kids and adults. Broomball is most appropriate for ages 8 or 9 and up (including adults), but younger kids may play. Participants should wear sneakers, layered clothing (it gets hot running around the ice), and HELMETS (a bike, ski, or hockey helmet is fine)! Some participants choose to wear other protective gear such a knee pads or elbow pads. Broomball is $15 per person and includes Broomball stick rental. MedStar Capitals Iceplex cannot loan out helmets or other gear. Unlike other programs, we can take reservations for Broomball. Please email Events@MedStarCapitalsIceplex.com with your contact information, session time, and approximate number of attendees. Please still plan to arrive early to the Broomball session. Want to try something new for your next birthday? Play Broomball! Party Packages start at $275 for 10 people and include a party room, pizza, drinks, and a Broomball lane reserved just for your group. Contact Parties@MedStarCapitalsIceplex.com to book yours today! All programs are subject to a capacity limit. Passes go on sale 30 minutes before each session begins. Check the schedule before coming to the rink.